Runoff Caverns is a large Dwarven ruin located in the Reach, west of Lost Valley Redoubt. 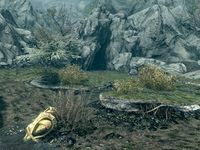 It contains the ruins of Vardnknd, which houses a dangerous Dwemer "weather witch" device capable of manipulating the weather across all of Skyrim. It consists of seven zones: Runoff Caverns, Vardnknd Gallery, Autumn's Bells, Spring's Symphony, Summer's Chords, Winter's Chimes, and Vardnknd Skykiller Gallery. Several of these areas contain their own self-contained climates and enemy types. Forgotten Seasons: Shut down a malfunctioning Dwarven weather machine. The Dwarven Crown: Gather all the components of a powerful Dwarven Crown from within a forgotten Dwarven ruin. The exterior appears to be an unassuming cave entrance, distinguished only by the strange torso of a Broken Dwarven Horse found sitting in a pool of water nearby. This section of the dungeon transitions from a natural cavern to a Dwarven ruin. 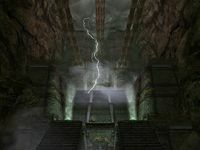 You will need to descend to the bottom of the main chamber and explore the side passages in order to access the ruins of Vardnknd. The central drawbridge can be lowered from the other side of the main chamber, creating a shortcut back to the entrance. This section is filled with hostile Mercenaries and Dwarven automatons. 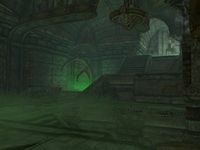 This section functions as a hub area for the entire dungeon, connecting to each of the other sections. Elberon can be found here, and will be struck by lightning the minute you enter Vardnknd Gallery. Elberon's Apprentice will spawn here as part of the Forgotten Seasons quest. This section consists of winding Dwarven passages filled with a green haze. The path is blocked by roots at several points, and can only be unblocked by killing a nearby Blooming Spriggan. This section is filled with various hostile and passive animals and also contains a boss-level Blooming Spriggan Matron. The Dwarven Spring Visage and Dwarven Drone Fly can be found here. This section is made up of lava-filled chambers crossed by various bridges and pipes. It contains hostile Flame Atronachs. You will need to guide a Repair Spider through this zone to activate each service waypoint dotted throughout; a Spider Control Rod can be found near the entrance for this purpose. This section is initially appears to be a snowy exterior area, but is in fact a large natural cavern which is subject to unending, artificially chilly weather. 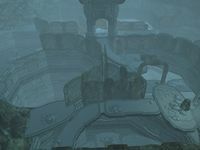 It is filled with vertical Dwarven architecture and half-frozen pools of water. Although merely a visual effect in the base game, the cold winds and icy waters of this section are compatible with the Survival Mode Creation and will be a severe challenge to navigate if you are playing with it enabled due to its effect on your character's Cold attribute. This area is filled with Frosted Dwarven Spiders, Frost Atronachs, and Ice Wraiths, and contains a boss-level Frosted Dwarven Centurion. The Dwarven Winter Visage can be found here. 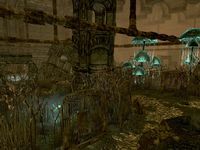 This section is initially inaccessible and can only be accessed by means of a set of stairs in Vardnknd Gallery which will rise as part of the Forgotten Seasons quest. It is one large chamber and contains the final boss of the dungeon, a giant Dwarven Spider called the Sky Orchestrator, which will drop the Ward of the Seasons cuirass when defeated. You will then be able to claim the Turn of the Seasons book and utilize a shortcut which will place you back at the beginning of Runoff Caverns, near the exit. This is the only location where Wild Spiky Grass can be found. The stairs leading to Vardnknd Skykiller Gallery may not rise visually, but you will still be able to ascend them once you've cleared all four of the seasonal zones. ?